Fish can be a simple, elegant and healthful meal for Fridays during Lent. Tim Van Doren, head chef at the Blue Marlin, shows a filet, pan fried in oil. 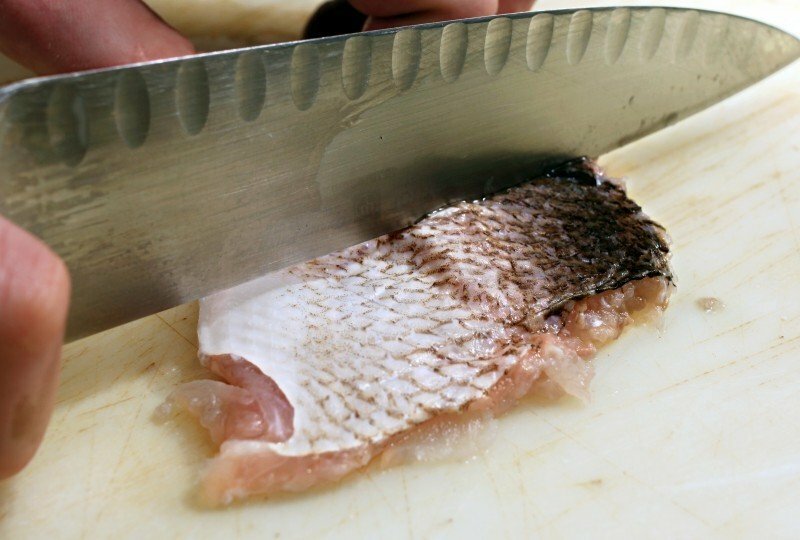 Pressing the dull side of a knife across the skin of a piece of fish in a scraping motion removes moisture for better crispness in the finished product. In Wisconsin, a lot of us regularly eat fish on Fridays. But this week, with the beginning of Lent, the emphasis on Friday fish will be that much greater — at least for Catholics. Long ago, Roman Catholicism prescribed strict rules for abstaining from meat during Lent, the 40-day period — not counting Sundays — of preparation before Easter. Current custom for Catholics in the United States is that they not eat meat on Ash Wednesday and Fridays during Lent, said the Rev. Ken Fiedler of Our Lady Queen of Peace Catholic Church, a large parish on Madison’s West Side. Americans eat about 15 pounds of fish per person per year, and they eat twice as much fish in restaurants as at home. Fish can be a little tricky to cook and some people are afraid of cooking it themselves, say local chefs who specialize in cooking fish. Tim Van Doren, head chef at the Blue Marlin, said it’s easy to overcook fish if you’re not careful. “Fish needs to be cooked to the right temperature or it starts losing a lot of moisture,” he said. A really good piece of fish, particularly smaller fish or a freshwater fish like walleye, should have a crispy skin on it, he said. But getting the skin crisp is an acquired skill, not something most people know how to do, Van Doren said. “A really crispy skin I think is quite delicious,” he said. The problem comes when you have a thin filet, he said. It’s hard to get the skin crispy but at the same time not overcook it. Van Doren favors pan frying his fish as a cooking method. “I generally recommend removing all the scales and using the back of your knife to kind of squeegee out excess moisture in the skin,” he said. From there, it’s important to have a hot pan and cook the fish until it’s crispy on one side. It needs to be cooked just very briefly on the other side. How long to cook a piece of fish depends on the thickness of the filet, Van Doren said. Something thin like a trout filet should not be cooked longer than five minutes, he added. Cooks can use flour to get the skin crispy or incorporate crusts such as corn meal or nuts or spices, Van Doren said. Colin Beaumier, who works at Captain Bill’s Waterfront Restaurant in Middleton, doesn’t eat a lot of fish, but said he loves the challenge of cooking it. He said people seem to be comfortable cooking salmon because of the prevalence of it in the past few years. Beaumier looks at cooking fish the same way he considers different cuts of beef. “You wouldn’t cook a sirloin the same way you’d cook a tenderloin,” he said. The amount of fat in the fish and the color are going to determine the best ways of cooking it, Beaumier said. The best resource cooks have is the place where they buy their fish. It’s also easy to research cooking methods on Google, he said. For mild-tasting whitefish, like sole or halibut or haddock, which are often overcooked, broiling is best, Beaumier said. Grilling any type of whitefish can be tricky, Beaumier said. “The higher the amount of fat, the brighter the color, the more variation you can have as far as pan searing or broiling or grilling,” he said. Beaumier himself prefers broiling most other fish. He recommends lower temperatures like 325 degrees or 350 degrees and periodically checking on the fish. For salmon, he recommends broiling it at 350 degrees for 7 to 10 minutes. For whitefish he said to cut that time in half. The heating element can be tricky, Van Doren added. Those who prefer grilling a piece of fish need to have the grill at the right temperature with proper amounts of oil on it. The same thing applies to cooking it in a pan. Cooks need to heat their pans properly. “If your oil is too hot or not hot enough, you can have problems with it sticking,” he said. Deana Foster, Hy-Vee’s in-store dietitian, recommends eating fish once or twice a week for the omega-3 fatty acids. Fish is low in calories, low in fat and is a good source of protein, she said. The darker the color, the more nutrients and antioxidants it has, she said, giving tuna as an example. Van Doren said people shouldn’t be intimidated to cook fish. They should embrace it. Place salmon filets skin side down on baking sheet with some extra virgin olive oil (sesame oil also works well. Use the oil of your preference). Season the salmon with the salt and pepper and place the fish in the oven for 10 minutes. You can check if it’s done by inserting a wooden skewer into the center of the salmon. If it’s warm, that is medium rare. If it’s hot throughout, it’s cooked through. While the salmon is baking, put the basil and orange juice in a blender and puree it for one minute and transfer it to a smaller container. Plate the cooked salmon and accompany with any number of sides you like. Right before serving, spoon some of the basil orange sauce over the top and enjoy. Grease a baking sheet with equal parts melted butter and olive oil. Place the walleye filets on the sheet, skin side down, and brush with a little butter and olive oil mixture. Season and place in the oven for 7-10 minutes until golden brown and hot. While the walleye are cooking, combine the sour cream, lemon juice, buttermilk, garlic and dill together and mix well. Gently fold in the chopped egg and keep chilled. Transfer the walleye filets to four warm plates and garnish with fresh dill, lemon, and top with the dill sauce. 1. Using a peeler or fancy microplane/zester, remove the zest from the lemons, being careful to avoid the fibrous pith. Be sure the zest you get is chopped fine. Add to a small bowl and add the juice from both lemons as well. 2. Mince the garlic as fine as you can, paying attention to remove the small base and also use a toothpick to remove the bitter germ piece on the inside base. Add the chopped garlic to the lemon juice and zest. 3. Chop the parsley leaves fine and add to the mix. 4. Add the olive oil and salt and adjust the taste as needed and chill. 1. Brush the tuna steaks with olive oil and season with salt and pepper. 2. Place in a shallow baking dish and then: Depending on your love of tuna (rare to well done), check the tuna steaks as they bake every 5 minutes. Again, with a wooden skewer: a cold center is rare, warm is medium rare, and very hot throughout will show well done. 3. When the tuna steaks are done to your liking, quickly transfer them to four warm plates and top with the gremolata and serve immediately.